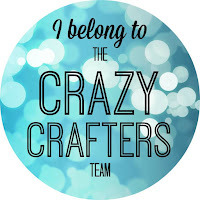 Welcome to the Crazy Crafters blog hop for August. You may just be starting the blog hop here at my blog or may have come from the person before me in the list below. If you get off track at any time, the full line-up below will help you move along from blog to blog so you see all the projects. At the moment you are visiting Stephanie Fischer, The Crafty Thinker. This month we are excited to showcase some of the amazing Bundles in the new Annual Catalogue by creating stacks of different cards using the same bundle. What's better than being able to buy punches or dies to match stamp sets (for those of us that aren't natural fussy cutters!)? Buying them as a bundle and saving 15%!! There are loads of bundles in the new catalogue (and even more coming in the soon-to-be released seasonal catalogue!) - so there's really something to suit everybody's tastes and needs. I've used two bundles for my stack of cards: Vintage Leaves (stamp set and matching framelits) and Beautiful Bunch (stamp set + Fun Flower punch). This is the first of my three cards. I layered English Garden DSP onto a Soft Suede card base. Then I made a square frame by layering So Saffron onto Old Olive. Then I arranged my leaves and flower. I used some dimensionals to add depth and interest. I stamped the frame from Awesomely Artistic in Soft Suede onto So Saffron with a sentiment from Teeny Tiny Sentiments in the centre. 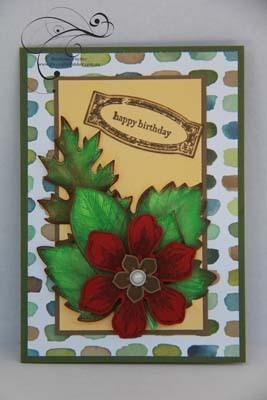 I cut this out using the matching framelit from the Project Life Cards and Labels set. I cut a banner (using the Triple Banner Punch) from Old Olive and layered the sentiment on top. I attached the banner to the card with dimensionals. The flower is stamped in Soft Suede onto Cajun Craze. After punching it out, I attacked it with my bone folder to give it some dimension. The centre is another of the stamps from the Beautiful Bunch set, stamped in Soft Suede onto Soft Suede card and punched out with the Petite Petals punch. It received the same bone folder treatment! I stuck a metal Rimmed Pearl in the centre. The next card is very similar but the base card is Old Olive. The frame is rectangular with So Saffron layered onto Soft Suede. It doesn't show in the photo (because it's very subtle) but I randomly stamped some of the leaves in Versamark onto the So Saffron layer. The flower is stamped in Soft Suede onto Cherry Cobbler but centre remains Soft Suede. I used a different Teeny Tiny Sentiment and after cutting out the frame I sponged the edges with Soft Suede ink. I attached the leaves and flower using some dimensionals as before. 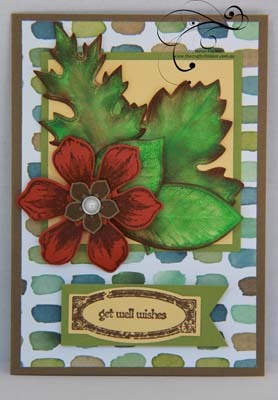 I stamped out all the leaves using a mix of green inks. I inked the entire leaf with Crushed Curry and then randomly sponged some Garden Green and Mossy Meadow onto the stamp before stamping onto my Very Vanilla card. It looked very effective but with all the colours I put on top later- my efforts may have been wasted! much water - but it didn't really matter in the end! My next step was to watercolour the leaves using a mix of Pear Pizzazz, Old Olive, Garden Green and Mossy Meadow ink and I took no care at all! Once they were dry, I felt they lacked vibrancy so out came the sponge daubers and I sponged on some Cucumber Crush and Garden Green, using a little Cajun Craze here and there to define them and give them a bit of life. This is the last card I made. After cutting out the DSP for the previous two cards I was left with a strip of it that I decided to use for this card. So I layered it onto a leftover piece of Soft Suede. I randomly stamped leaf images onto a piece of Mint Macaron with Versamark and then inked the edges with Mint Macaron ink. I layered that onto a base card of Mint Macaron for a subtle and elegant appearance. I positioned my DSP strip and then went to work with my leaves and flower! 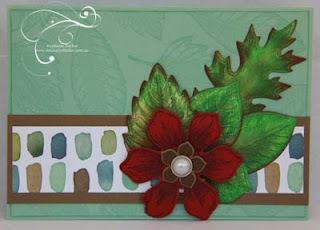 This flower is also stamped in Soft Suede onto Cherry Cobbler card with a Soft Suede centre and another Metal Rimmed Pearl. I hope you've enjoyed these cards, I would really welcome your comments. Thanks for taking part in our blog hop, there are so many amazing ideas and so much inspiration you don't want to miss. Remember that currently you are at my blog - Stephanie Fischer, so check the blog hop line up list to see who is next in the list and click on their name as you don't want to miss out on seeing any of the blogs and the amazing inspiration they contain. How wonderful! The sponging has come up really well - Thanks for the tutorial and pictures too. I am a visual person and always love to see things explained that way. So thank you for the extra work you put in to explain what you did Stephanie. Great projects - and wonderful design tips. The leaves are stunning. Very striking card designs, the multitude of greens and red really pops. The detail in the leaves are amazing, thanks for sharing your techniques. 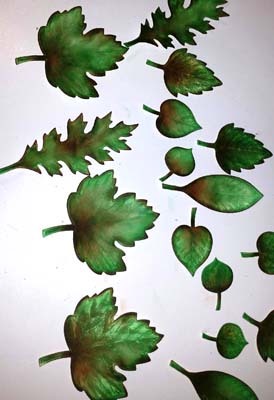 WOW WOW WOW for all the effort you've put in to making the leaves so realistic - just gorgeous Steph! Love all 3 cards. My eye was immediately attracted to the bold colors. Thanks for sharing your tutorial! Love your cards. Someone was asking me for some inspiration for this set on Friday morning, what timing. Gorgeous cards Stephanie. Great work! Holiday Catalogue 2015 - Sneak Peak! No Bones About It - Dinoparty!